Type anatomy affects the readability and legibility of text. The proportions of font width, x-height and weight are key factors that make it easier to decipher and read letters and numbers. Both Utopia and Univers meet the following type proportion requirements for readability (see Figure 5.3.1). 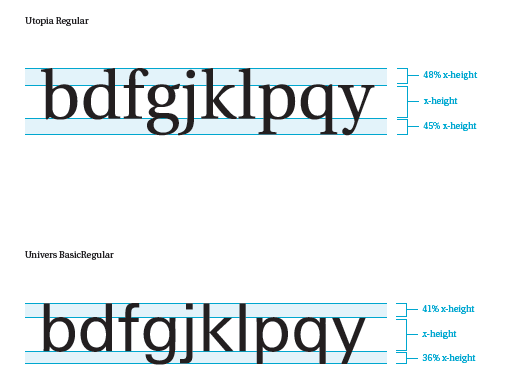 Width – The percentage of width to height of the uppercase X should be 65%-95%. X-height – The percentage of the height of the lower case x to the uppercase X should be 65%-75%. Weight – The percentage of width of the vertical stroke of the lowercase h to the height of the - uppercase X should be 10%-15%. Distinct ascenders and descenders for the following lowercase letters are required for accessibility: b, d, f, g, j, k l, p, q, t, y. Both Utopia and Univers meet these requirements (see Figure 5.3.2). The numbers 5, 6 and 8 are the most difficult to distinguish and read in less accessible typefaces. All numbers are legible in both the Utopia and Univers typefaces (see Figure 5.3.3).